Every starting quarterback in the NFL gets a weekly press conference at the podium so the world can hear their perspective for that week. It’s a routine task for veterans but make no doubt it’s an easy opportunity to make news depending on what you say. Just ask Cam Newton. 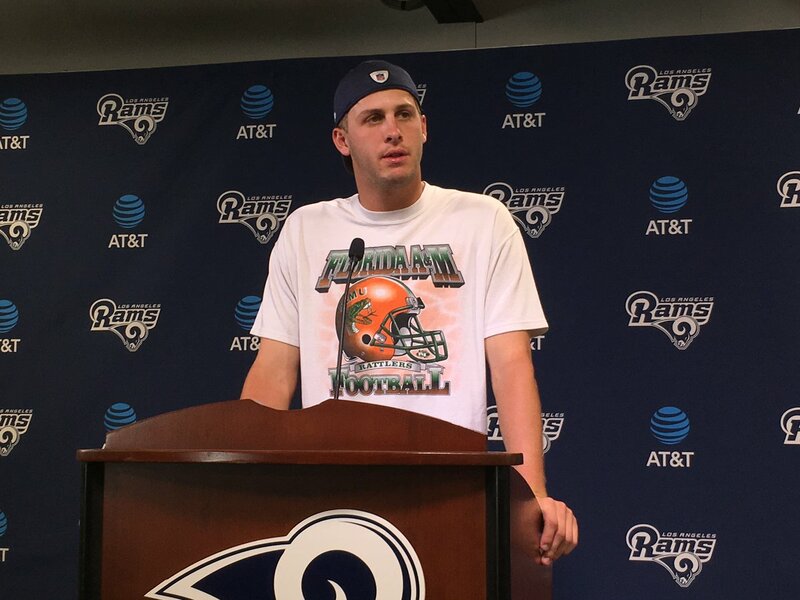 On Wednesday Los Angeles Rams quarterback Jared Goff made news from a fashion perspective when he showed up wearing a Florida A&M t-shirt. Goff is a second-year player out of the University of California and has no obvious connection to FAMU. He has two teammates from HBCUs, South Carolina State’s Temmarick Hemingway, and Southern’s Lenard Tillery, but no one would suspect them of stocking up on Rattler gear. Support or a random choice? Goff definitely got the attention of FAMU grads working in the media, who spread the photo across Twitter. Some fans were interested in Goff’s fashion choice and wondered if this was a random event or a subtle show of support from the quarterback. But leave it to a FAMU man to get to the bottom of things. Rattler graduate, Jordan Culver, a friend of HBCU Gameday who works for the Tallahassee Democrat, found the apparent motive. One of the assistant athletic trainers, Byron Cunningham, is a 1998 graduate of FAMU. This press conference won’t garner national attention in the manner that Cam Newton did, but HBCU fans were surely asking the question, “Where did the FAMU gear come from?” So it looks as if he won’t be the next Martin Lawrence from the early 90s Def Comedy Jam, but the young man definitely earned himself some extra eyeballs this week.